Wisteria and other plants around the Stanley Park Pavilion and Stanley’s Bar and Grill at Stanley Park in Vancouver, British Columbia, Canada. Among many other park features, I enjoy the architecture/design of the historic buildings in Stanley Park. These include the Vancouver Rowing Club, Rose Garden Cottage and the Stanley Park Dining Pavilion shown above. The Stanley Park Pavilion was built in 1911 and features the Lord Stanley Ballroom, the Rose Garden Tea Room, and Stanley’s Bar and Grill. The Stanley Park Ecology Society also has it’s offices in the Pavilion. 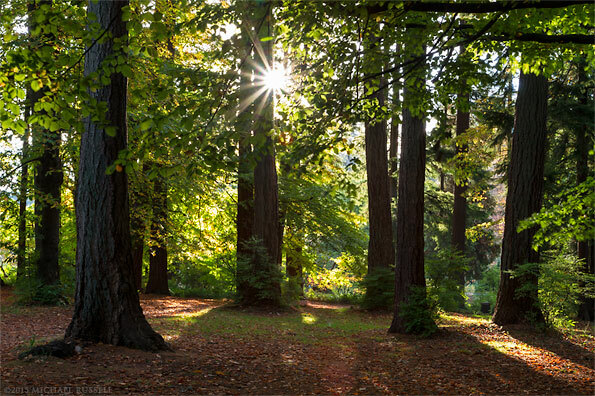 For more photographs of Stanley Park visit my (new!) Stanley Park Gallery. Panorama of Coal Harbour from Stanley Park seawall along the western end of Coal Harbour in Vancouver, British Columbia, Canada. 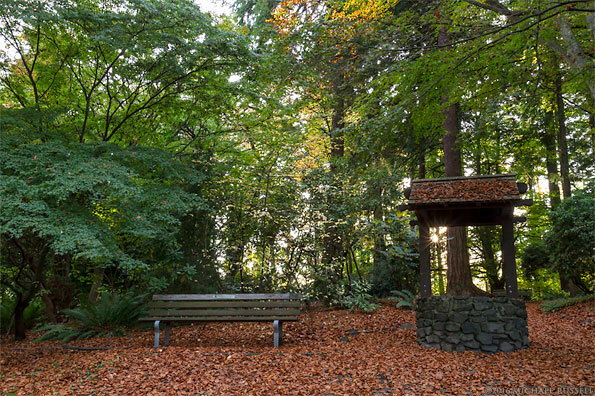 During my last trip to Vancouver’s Stanley Park in October I photographed a few places I had been before from new perspectives. After having visited the Air Force Garden of Remembrance for the second time I headed to the west end of Coal Harbour. I have photographed some of the buildings of Vancouver’s West End before, but most often from further into Stanley Park near the Totem poles or the 9’oclock Gun. The first panorama here shows a very wide view of what you can see of Vancouver from the end of Coal Harbour. 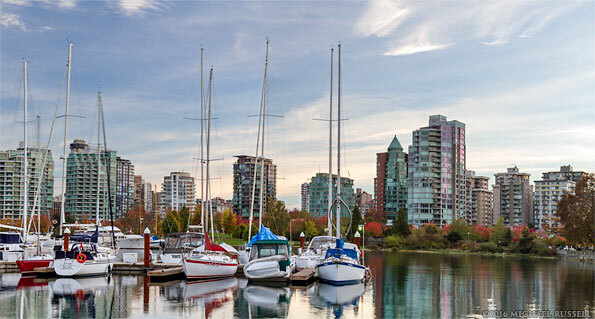 On the left you can see the boat houses of the Royal Vancouver Yacht Club (and the cranes of Port Vancouver behind them), Canada Place and the Trade and Convention Center, the buildings of downtown Vancouver, and finally Devonian Harbour Park and the apartment and condo towers in the West End. The second photograph shows one of the views in Stanley Park from the seawall looking towards downtown Vancouver. These boats are moored at the Vancouver Rowing Club – a building familiar to most as it sits at the entrance of Stanley Park next to Georgia Street. Finally we have the photograph below looking towards the West End condo towers from the seawall next to the Vancouver Rowing Club. For more of my recent Vancouver area photography please visit my Vancouver Coast & Mountains Gallery. 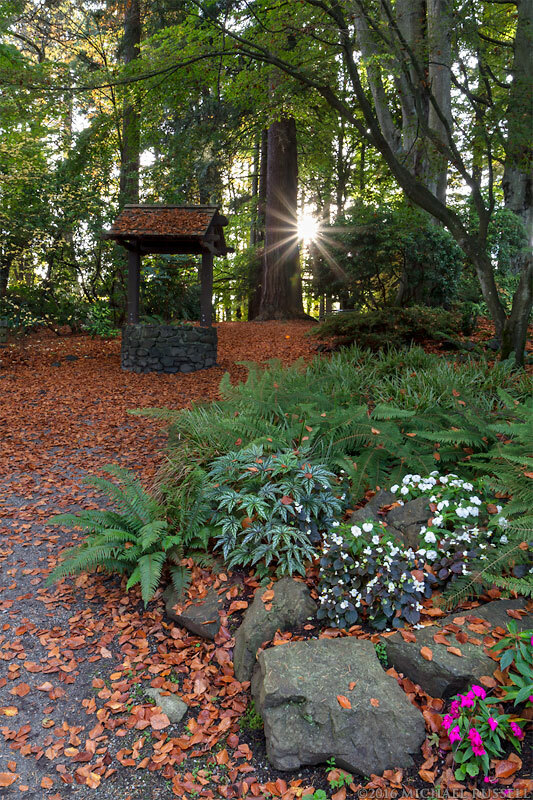 Fall flowers and the wishing well at the Air Force Garden of Remembrance in Stanley Park, Vancouver, British Columbia, Canada. One of the many small areas in Vancouver’s Stanley Park that has been on my list to photograph is the Air Force Garden of Remembrance. This is a small area, located just west of the Stanley Park Dining Pavilion and contains a bench, a small garden, a waterfall and a pond. The garden was created in 1948 to commemorate the Air Force personnel who died in World War II. I had previously photographed this in the fall fo 2013, but came back hoping for some nicer leaf colours and a few more of the flowers still around – and I picked the right time this year. The pond’s waterfall was dry, however – likely due to our historic dry summer months in 2015. I haven’t tried the starburst/sunburst trick before. It can be a bit of a gimmick in my opinion – you’ll see some photo galleries with the majority of shots with a sunburst in them. Here the sun was right in the way, and I either embraced it in my composition or tried to block it with tree trunks or foliage. Setting the aperture to f/16 and f/18 allowed this effect to work in these photographs. I like the results, but I will probably only use this technique when the sun is getting in the way. The photograph below isn’t from the Air Force Garden of Remembrance, but is actually just above the Stanley Park Rose Garden. I liked the way the Douglas Fir trunks lined up, though this certainly doesn’t show a natural forest setting. I was not able to find a lot of information on the Rose Garden Cottage in Stanley Park. 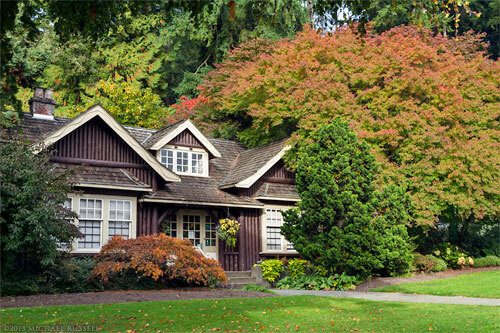 The Rose Cottage was built during World War I (reportedly in 1914) and now functions as a building in the service yard of the Mounted Division of the Vancouver Police Department. In October I made this photograph of the Rose Garden Cottage in one of the few areas of Stanley Park not obscured by fog. I could barely see the Lions Gate Bridge and you could not view downtown Vancouver from Stanley Park at all! I was happy to find the cottage and rose garden area relatively free of fog – with even a little sunshine breaking through occasionally. See more of my photographs from the Vancouver Coast & Mountains. One of the first subjects I like to photograph in the Spring, in addition to wildflowers, are the Cherry trees in Vancouver. There are often a lot of flower bulbs also in bloom (tulips, daffodils etc) at the same time, so there are often great photo opportunities at that time of year. 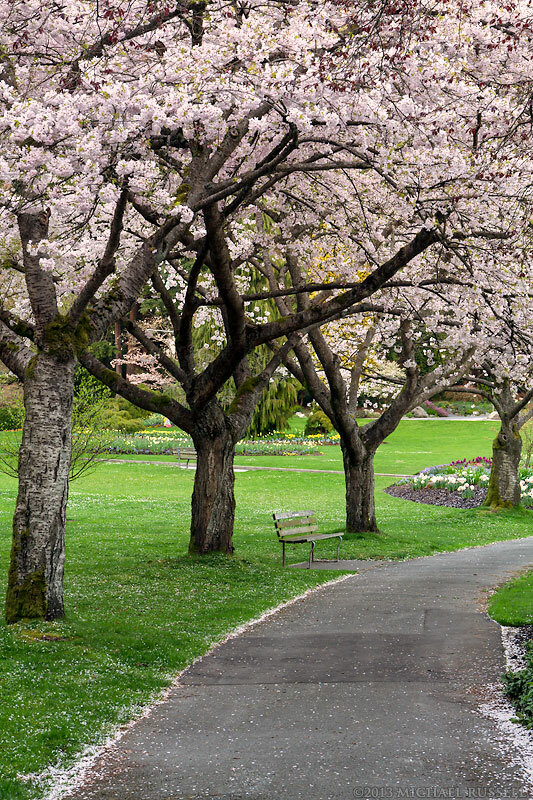 This past April I was in Vancouver’s Stanley Park and made some photographs of these Cherry trees blooming along the South Creek Trail (near the Rose Garden). I love photographing Stanley Park, once the sun starts go to down there are always other opportunities to photograph the Lions Gate Bridge or the downtown skyline. I always find it difficult to narrow down a years worth of photographs into one list of the “best”. It is a good exercise, however, to really sit down and go through your work and determine what images best fit your current vision for your photography. I did this back in 2010 and 2011 as a part of Jim Goldstein’s project and I am please to enter my images again for this years version. All of these photographs are available as Fine Art Prints. So in no particular order these are the “top” (probably better termed as favourite) photos I have made in 2012. I have not posted a large panorama in a while. 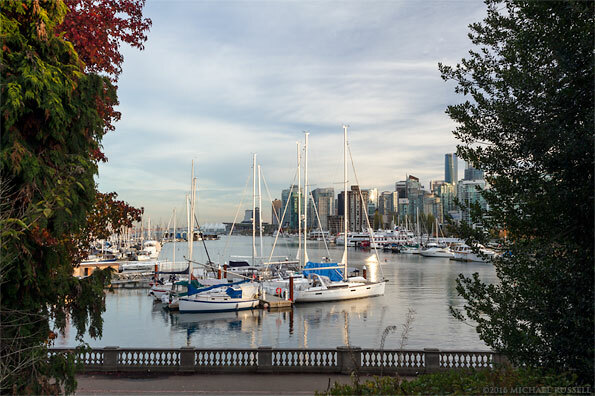 This is a 14 exposure panorama of the iconic view of downtown Vancouver from Stanley Park. Canada Place is the building on the right and is used for convention center space. The next building is the new Convention Center. Next to the Convention Center is the 2010 Olympics torch (you can just see the top of it) and then we have the Seaplane Terminal. I was in the park looking for fall colors, and was initially attracted to this scene due to the great leaf color on the right hand side near the seaplane terminal. I made another row of photos to catch more of the buildings but the light had changed in the 3-4 minutes from the first exposure and the result was not pretty. So I only included the lower row. I’m going to have to get better with my timing or just work faster next time!